Firstly, The most important thing to know, is normal values. Providing the paper speed is standard at 25mm/second, each small square = 0.04seconds. So the only other thing you need to know, in order to correctly identify ECG abnormalities, is your 4x table! Simples. 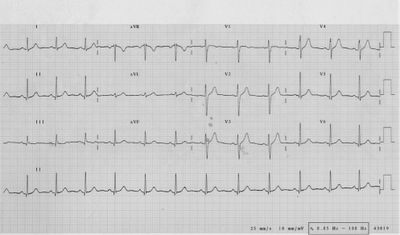 One small square on a ECG trace (at 25mm/sec speed) = 0.04sec. It’s a great exam technique for students – don’t let the examiner get a word in edgeways. Fill the time with FACTS, and don’t make guesses (for 3minutes, at least) and you can’t go wrong! 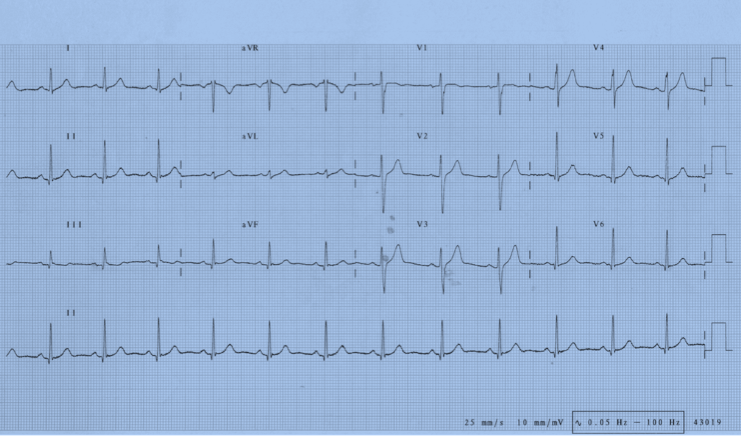 For every ECG, all you need to do is describe what you see and you’re half way there. Always consider the following aspects, learn them by rote, and just talk away. 1. Is there electrical Activity seen? 2. Is this a 12 lead, or single lead, analysis? 3. Is the paper speed (25mm/s) and gain (1mv=1cm) standard? Consistency – same in all leads? Isoelectric (normal) or Depression? / Elevation? All of this is just factual stuff. You can talk away for 3minutes without even attempting to analyse, let alone have a stab at a diagnosis! If you methodically consider the above whenever faced with an ECG, you’ll always end up with some sort of sensible diagnosis. Even if you guess wrong, the intelligent banter that you've just displayed will as least make people think it was a very educated guess! 1. 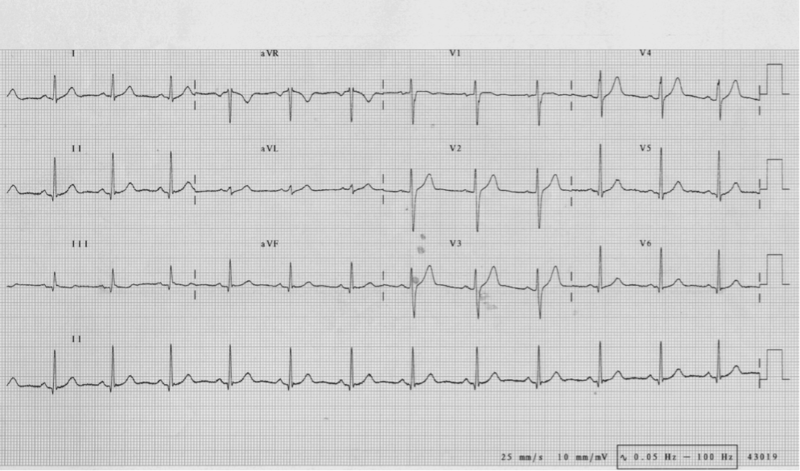 The lead appearances and orientation of a normal 12 lead ECG. 2. The normal values for size, and duration, of the waves forms. Always bear in mind the direction of a normal electrical impulse through the myocardium, and the position of the electrodes on the external chest wall/limbs. That way, you should be able to remember, which lead complexes/waveforms should always be positive. 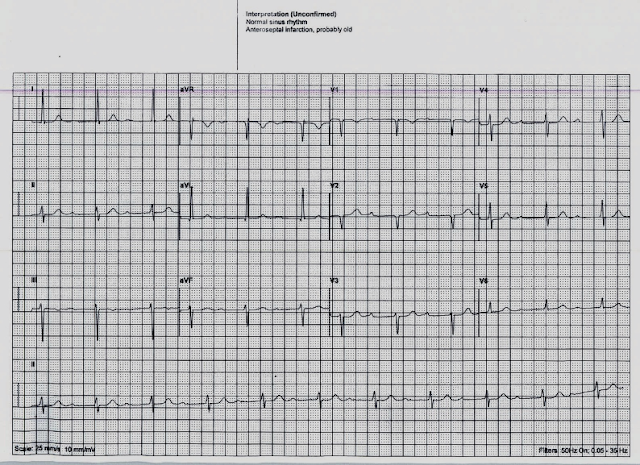 For this reason the QRS wave aVR should always be negative. Remember - ECG interpretation is an 'art form'. Factual descriptions, based on the above, can never be truly 'wrong'. Are you happy with the computer analysis? 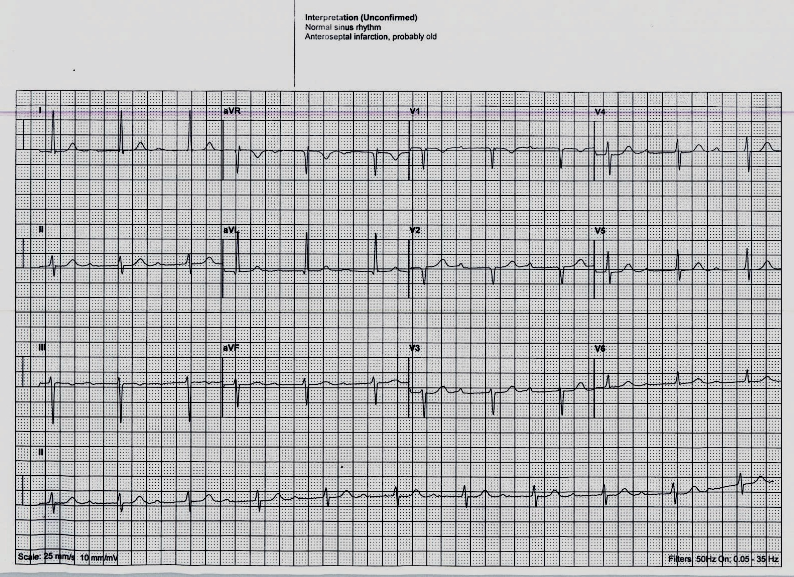 The main purpose of this ECG case is to highlight the potential pitfalls of relying on machines. Most of us are aware that the digital machines are often 'over-sensitive' and detect minor artefacts which they interpret as abnormalities. But, perhaps more alarmingly, is their ability to falsely reassure. (I've even seen a 'barn door' AF reported as normal sinus rhythm). Be warned. Be careful. This looks like a first degree heart block. (Remember the definition of sinus rhythm recently shared). See the lead II rhythm strip - the P waves can be seen, and do have a regular relationship with the QRS, but the PR interval is very prolonged. For the time being, we won't get bogged down with details of this one. We'll go into 'blocks' in more detail in a later class. We'll also talk about 'pathological' Q waves at a later date - machines frequently report 'possible old infarct' when in fact there is little evidence on the ECG. By all means use the machine as a cross-checking reassurance - but only after you've made your own mind up. Cover it to start with. Then question it, if it's different. You are probably right. There's nothing better than clinical judgement. It is useful to know the definition of normal sinus rhythm, so that you can instantly recognise it. 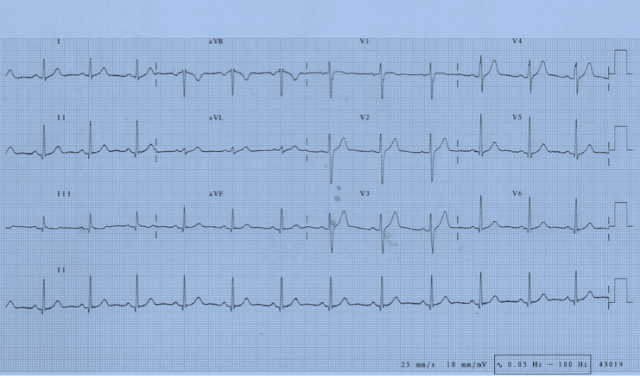 Only then, can you instantly recognize an ECG which is not ‘normal’.